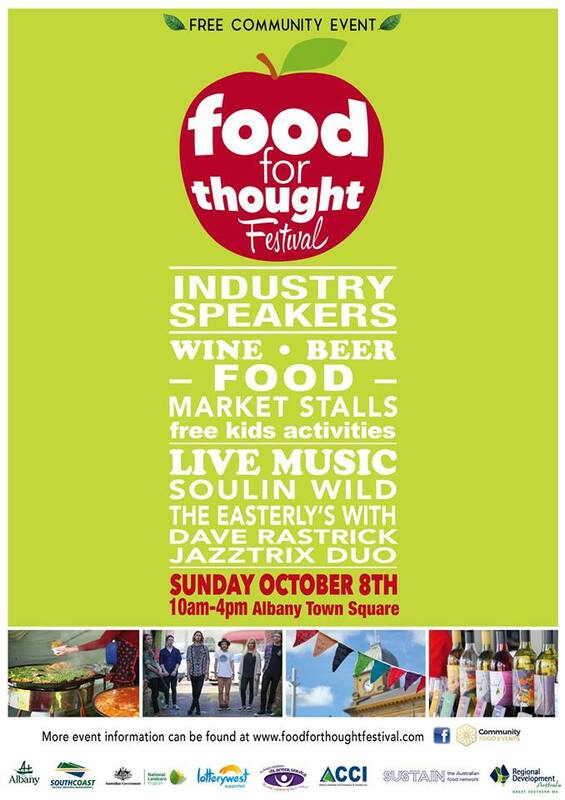 The 2017 Food for Thought Festival is part of Fair Food Week. Hear from industry leaders Jude Blereau(Nourishing Wisdoms) and Rick Bieber(Agricultural Systems modelling Nature) in the morning and enjoy a live music expereince with headlining music act Soulin Wild plus lots more live local music by Vibe Sound Collective. The Food for Thought Festival includes a variety of stall holders selling amazing local produce such authentic sourdough breads and whole food cakes, locally grown and produced organic jams, chutneys, honey and fermented products such as kim chi and sour kraut, crisp extra virgin olive oil, locally made wines and beers plus much more. Shop local and hear direct from the stall-holders about how their products and services are making a positive impact in the Great Southern community and beyond. Free childrens entertainment all day.